The Forsyth Family Association was founded in 1915, but it languished between the wars, so that the present Society was not formed until 1977. 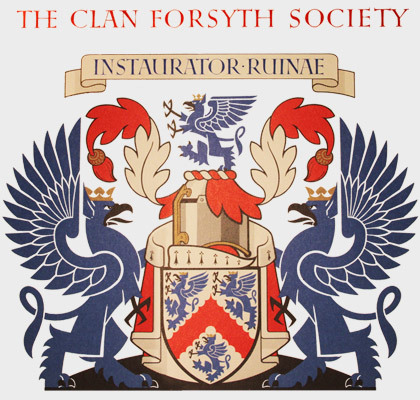 Our aim is to foster a sense of kinship between Forsyths the world over, and to further the reputation, interests, and aspirations of the Clan. The Clan holds an annual gathering in central Scotland. The venue varies, but it is always chosen to be easily accessible by road or rail. This gathering is an informal family or ‘ceilidh’ style affair, with good food, some dancing and music, and plenty of time to catch up with old friends and to make some new ones. We also try to arrange smaller events in other places. The Clan circulates an annual newsletter to keep members in touch, wherever they live. This provides an update on Forsyth Family news and forthcoming activities. If you are trying to trace your Forsyth ancestors, then why not contact us for we have an extensive historical record and can connect branches of the family through the centuries. Of course, the Clan has its own distinctive and attractive tartan, which is worn with pride, and which is registered in the official record of Scottish Tartans. Lastly, the Society administers a small benevolent fund to help and assist anyone with the name Forsyth, or their dependants, who may be in needy or deprived circumstances. This Trust is a registered charity, and it is maintained by contributions or covenants from members, and anyone else who may wish to promote and support its purpose. As well as the parent Society in the UK there are branches in Australia, New Zealand, and the USA. We also have members from as far as France, Germany, Japan, Norway, and Peru. Before 1488 David Forsyth, Burgess of Stirling, bought the lands of Dykes, otherwise known as Hallhill, near Strathaven in Lanarkshire. The ancient castle, which had stood from before that time, fell into ruin and was demolished in 1828. In 1540 the family left Dykes and moved to Inchnoch Castle in Monkland, Lanarkshire. It was this family that was subsequently to set up branches in Ayrshire, Aberdeenshire, Glasgow, North America and Australia. William Forsyth, a Bailie of Edinburgh in 1365, must have been a Burgess of the city from about 1345 to achieve this office. He may also have been a descendent through one generation to the William who signed the "Ragman Roll". William of Edinburgh had two sons, William who became a Burgess of the city in 1374 and a Bailie in 1394 and Malcolm who was a Burgess before 1381. This William has two sons. William, who was a Burgess of Edinburgh in 1423, moved to St. Andrews, in Fife, and purchased the Barony of Nydie in 1435. John, a Burgess in 1397 became a bailie of Edinburgh in 1425. Thomas Forsyth was a Burgess of Edinburgh in 1439 and may have descended from John. From Edinburgh spread many branches of the family to the Lothians, Borders and Dumfries as well as to Fife, Aberdeenshire and to Ulster and the Americas. David Forsyth was a Burgess of the city in 1478 and in 1487 Dom Thomas de Forsyth, Prebendary of Glasgow, endowed the chapel of Corpus Christie in the Cathedral. There are continuous records of the family as merchants and Burgesses of the city through the 16th, 17th and 18th centuries. It was from Glasgow that members of the family settled in Argyllshire and Dumbartonshire and emigrated to Ulster, the Americas, South Africa and Australia. Nydie, near St. Andrews, was a Barony under the superiority of the Archbishop of St. Andrews, Henry Wardlaw, when the lands were purchased by William Forsyth in 1435. His son, Henry was beadle of St. Andrews University from 1456 to 1461. In 1484 Alexander, the fourth Laird was appointed Sheriff-Depute of Fife and sold the family lands at Foulford in Edinburgh in 1491. 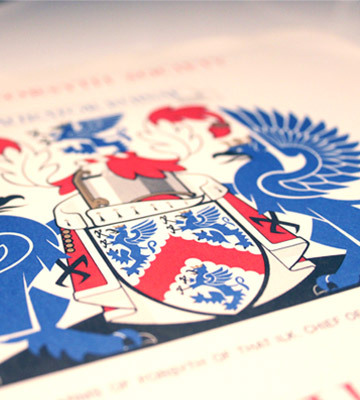 Armorial bearings were granted to him in 1492 by the Lord Lyon, Sir James Balfour. Alexander died at Flodden in 1513. His grandson James married Elizabeth Leslie before 1520. Elizabeth was grand-daughter to George, fourth Earl of Rothes, and great grand-daughter of King James III. 1523 the superiority of Nydie transferred to the Earl and the fortunes of this branch of the family became closely tied to those of the Leslies. Descendants of this branch of the family are believed to have continued living in Fife to the present day and are represented in the Forsyths at Falkland who have a documented history from before 1607. Our present Chief, Alistair of that Ilk, has connections with Falkland where his family was resident as Lairds at the end of the 16th century. There are also records that show a family of Forsyth, believed to be the ancient Chiefly line, had been associated with the Royal House of Stewart and Falkland Palace since the end of the 14th century. From Nydie branches spread to Dundee and up the east coast to Aberdeen. Descendants are living today in North America and New Zealand as well as other parts of the United Kingdom. The earliest record in Aberdeenshire is the sasine of Gilcamstoun in 1456 to David Forsyth who was believed to have moved north from Edinburgh. Later his grandson died with King James IV under the King's standard at Flodden Field in 1513. William Forsyth was the Member for Forres in the Scots Parliament of 1621. Settlement in the North-East also took place from 1508 when Alexander, son of David Forsyth of Dykes, settled near Monymusk where anciently his fue was known as "Forsithsland". From him probably descended the Rev. Alexander John Forsyth, who was the inventor of the percussion lock which advanced musketry in the 18th century and earned him a pension from the crown. Although the use of coloured threads by the Celtic people of Central Asia was adopted long before the foundation of Scotland it was included in materials randomly and purely for decoration, it did not have any territorial or family significance. It was the Celtic settlers to Scotland who brought this form of decoration with them and was over the centuries developed into the advanced form we know today as tartan. First different designs signified the wearer was from a particular district and confined to the highland areas of the country then by 18th century tartans were adopted by families and clans principally in the Highlands where it became a dress of honour identifying the different clans who were frequently engaged in territorial and other disputes. It was the military who popularised tartan beginning with the foundation of the Black Watch in 1725 who wore what was known as the Government Tartan. Because the first troops were raised from the estates of the Duke of Argyll, a strong supporter of the Hanoverian Monarchy, the Tartan as it remains today was based on the Argyll district design of Dark Green and Black. About this time many Highland Clans were beginning to adopt different tartans to signify their allegiance to their Chief and so it was by the rising of 1745-6 the many clans who rallied to the cause of the Young Pretender could be distinguished by the tartan they wore. Following the defeat at Culloden and the brutal pursuit of anyone suspected of being associated with the rebellion, either in person or sympathy, the wearing of the Kilt and display of tartan together with the playing of bagpipes was forbidden, this was reinforced by an Act of Parliament in 1747 which at the same time stripped the feudal system personified in the powers of the Baronial system by which a baron might raise his tenants to arms, the Baronial courts were also reduced and most of their judicial functions transferred to the Sheriff Courts. It was as a result of the fear of invasion by Napoleon and his French troops that a system of the raising of irregular military formations known as Fencibles was instituted in England and in Scotland the Duke of Gordon raised and funded his first regiment called the “Duke of Gordon’s 4th Fencible from his estates in 1775. For a uniform they were clad in Government Tartan uniforms for in recognition of the value attached to the wearing of the Kilt in Scotland Parliament had relaxed the proscription of 1746. A second Regiment was raised from the Duke’s estates in 1793 and it was decided that it should have a distinctive tartan, an idea put forward by the Duchess. At this time a letter written in 1793 by William Forsyth, a manufacturer from Aberdeenshire stated “When I had the honour of communicating with His Grace the Duke of Gordon, he was desirous to have patterns of the 42nd Regiment Plaid with a small yellow stripe properly placed. I enclose three patterns of the 42nd plaid all having yellow stripes, when the plaids are worn the yellow stripes will be square and regular. I imagine the yellow stripes will appear very lively.” One of the patterns was then selected. The Duke’s second regiment was now named “The Gordon Highlanders” and the 4th Fencibles were then incorporated into it, all wore the plaid designed by William Forsyth whose place of business was in Huntley, Aberdeenshire. The date 1793 is also given by the Scottish Tartan Authority for the design and production of the Forsyth plaid, indicating that William Forsyth whilst designing for the Duke also produced the design for his family, the tartan we recognise today as the “Ancient Forsyth”. The date is interesting as our plaid is very similar to that worn by the Clan Leslie who have replaced our yellow stripe with a white one, however, the Authority give a date of 1850 for the “Hunting Leslie”. These dates contradict the information given by some writers that Forsyth, was a later Tartan could be attributed to a “Lazy” designer who had simply amended the Leslie tartan by the substitution of a yellow stripe for the white. Today there are some variations to our Forsyth tartan though all use the “thread count” which is a system used by manufacturers to faithfully reproduce the pattern. The Forsyth “Pipers Tartan shows a bolder pattern whilst the coloured thread is slightly muted. The Forsyth “Muted” tartan is altogether more olive and brown in appearance but still uses the same thread count, it is a relatively modern interpretation of the plaid and suitable for jackets and trews. The subject of genealogy is one of the most important aspects of our Society. Many peoples' first reason for joining our Society is to find out more about their own particular family. As a Society we are very fortunate in that we have a wealth of records and data on various sections of our family. These records have been collected over many years and are the efforts of many peoples' hard work. As a Society we are happy to answer individual inquiries but will never make our records public knowledge like putting the information on the Internet. Before making any contact with the Society we recommend you get as much information together as you can from old records or just by talking to older family members. A family history form is available here and we recommend you fill in as much of this as you can and then send it to us and in the first hand we will endeavour to try and match you up with existing records if this is not possible then we might have to ask for a fee to conduct a more in depth search on your behalf. The genealogical assistance given by our Society is normally done by volunteers and so if there is ever a backlog of work priority will always be given to paid up members of the Society. In this ever security conscious world it is nice to know that youngsters can continue to travel but at the same time their families know that there is a network where they can get in touch with should they have any problems. We believe that there are many youngsters who are travelling overseas and many more who would like to travel but are restricted by lack of local knowledge and places to stay. Could we ask that any youngsters who are intending to travel overseas to let us know and we can then inform the Societies in the countries concerned so that if for nothing else they would have a number to ring in case of any problems or should they be requiring local information. On the same subject could we ask that people who might be interested in acting as hosts make contact with their local branch secretary so that we can match up any interest this goes for people both her in the UK or from Societies overseas. 1. Parents would feel more at ease knowing that their children had made contact with the local Society. 2. It might enable more young people to travel knowing there was someone assisting them at the other end. 3. The youngsters would get a much better idea of our overall Societies activities. Should you be about to travel or are wishing for furher information on the Youth Travel Scheme then please get in touch via the contact page or via email.